There are two kinds of players. Those who play video games. And those who play with video games. Marco Mendeni belongs to the latter category. It is not a matter of semantics. For a player, the message is the medium. For Mendeni, the medium is the message. The difference is crucial. Mendeni appropriates a medium in its entirety – its aesthetics, logic, and eidos. He likes to take things apart and put them back together – not exactly as they were. Iteration is the name of his game. Mendeni triggers epistemological short circuits through actions that subvert the viewer’s expectations. 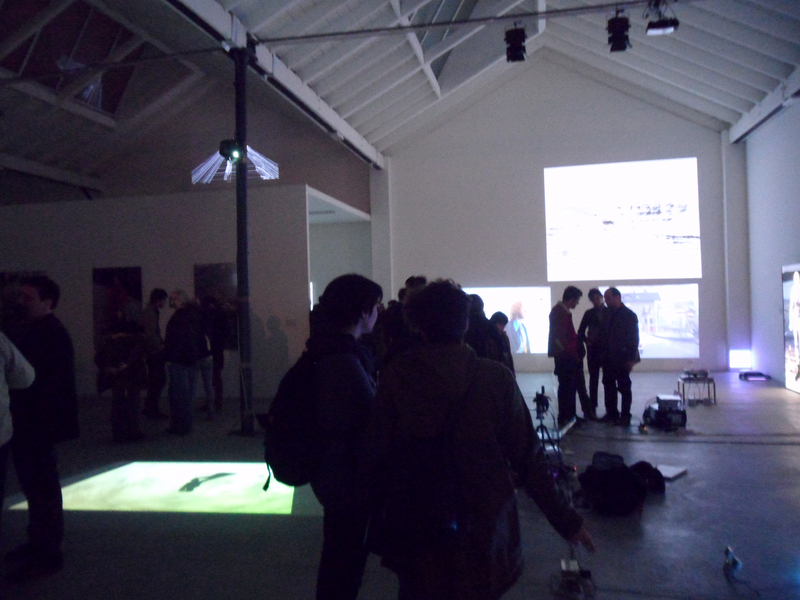 He brings to the surface the parameters which regulate the inner workings of virtual environments. His foregrounding practice evokes the techniques of the Nouvelle Vague filmmakers, like Jean-Luc Godard. The director of À bout de souffle deliberately disrupts the arbitrary logic of narrative and aesthetic conventions that define our sense of cinematic reality (Galloway 2006). In the process, he forces the spectator to come to terms with the artificial nature of film. Mendeni applies Godard’s method to a different medium: digital games. Like his precursor, he does not abide to the rules. On the contrary, he invents new rules, new contexts, new games. Mendeni creates novel solutions, situations, and simulations. His eclectic practice ranges from synaesthetic performances to the heaviness of concrete, which reifies fluid, abstract moving images. 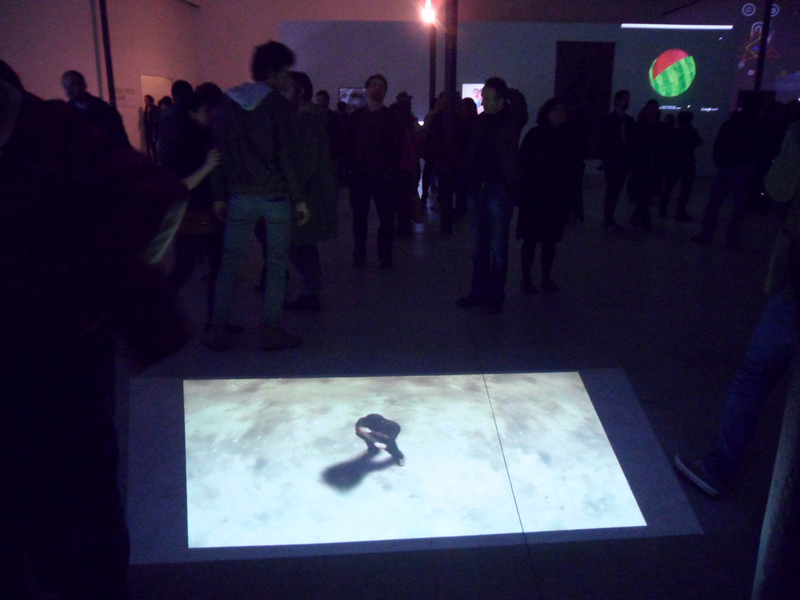 Sounds, installations, and gestures: Mendeni plays with channels and codes, signals and formats. 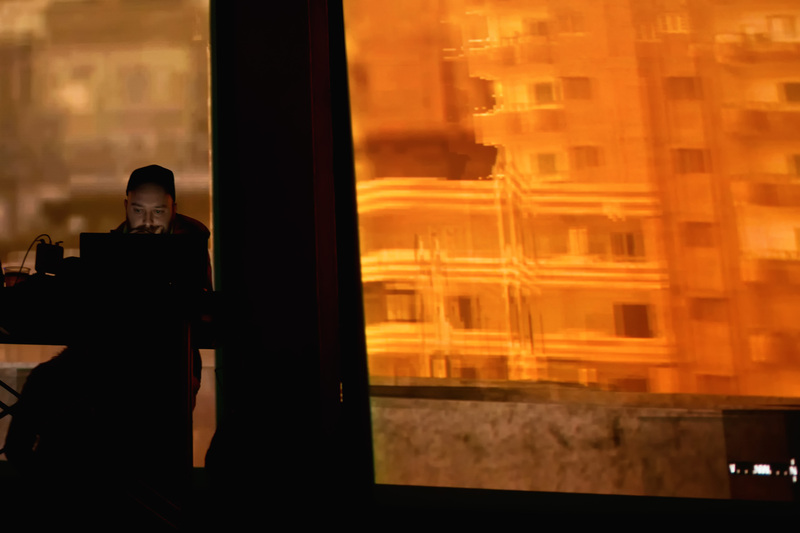 He produces a peculiar kind of video art by tinkering with the games’ virtual camera. He photographs simulacra. He juxtaposes lines and polygons, colors and noise. He wanders into uncharted territories, discovering secret passages. DECEPTIVE PERCEPTIONS urges the viewer to acknowledge the role of algorithms in creating a world as Will and Simulation. What happens to the transcendental categories of space and time as we move from the material to the ethereal? DECEPTIVE PERCEPTIONS is an invitation to dissociate and deconstruct, to displace and discern. After all, Mendeni’s works are a possible reaction - and a very convincing one - to Bruno Munari’s call for arms. In his seminal Manifesto of Machinism, apparently penned in 1938 and published in 1952, the Milanese artist wrote: “We live in a world owned by machines. We live among them, they help us do everything, from working to playing. [...] In a few years, we will become their little slaves. The artists are the only ones who can save mankind from this danger.” According to Munari, artists must develop a close relationship with technology, abandoning the traditional disciplines of painting and sculpture, doing away with “romantic brushes, the dusty palette, the canvas, and the easels.” The artists, Munari added, “must learn the mechanical anatomy of the machines, their mechanical language, their nature... They must distract them, make them behave erratically, create works of art with the machines, their tools.” Mendeni took up the challenge, turning the machines’ errors and glitches into a new kind of aesthetics. But there is nothing automatic or impersonal in this manipulation. His practice could not be more different from Andy Warhol’s desire “to become a machine” (Swanson 1963). Mendeni is a visual mechanic. A hacker who deconstructs, rebuilds, and repurposes his favorite toys. He makes them do things they were not designed to do. By reinventing the code, Mendeni turns machines into artworks, fulfilling Munari’s mandate. 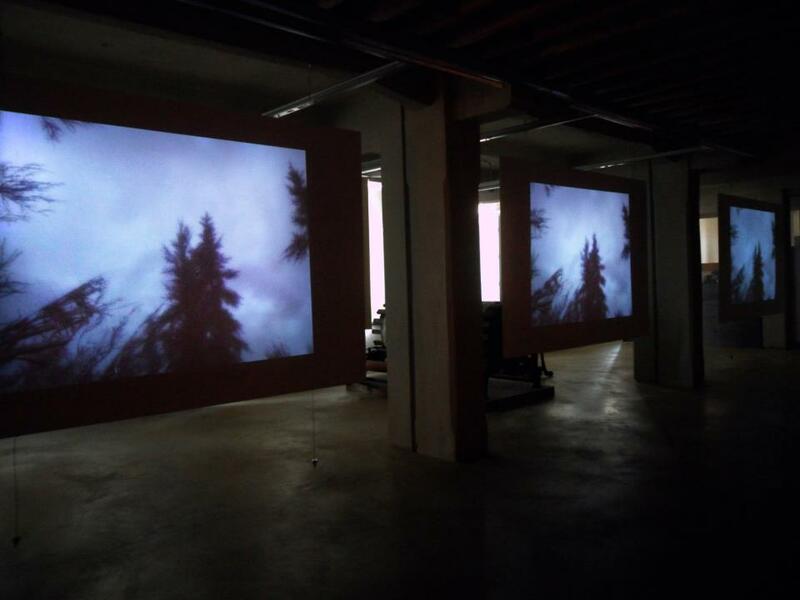 He introduces the viewers to new visual and psychological landscapes. Mendeni is a game changer. 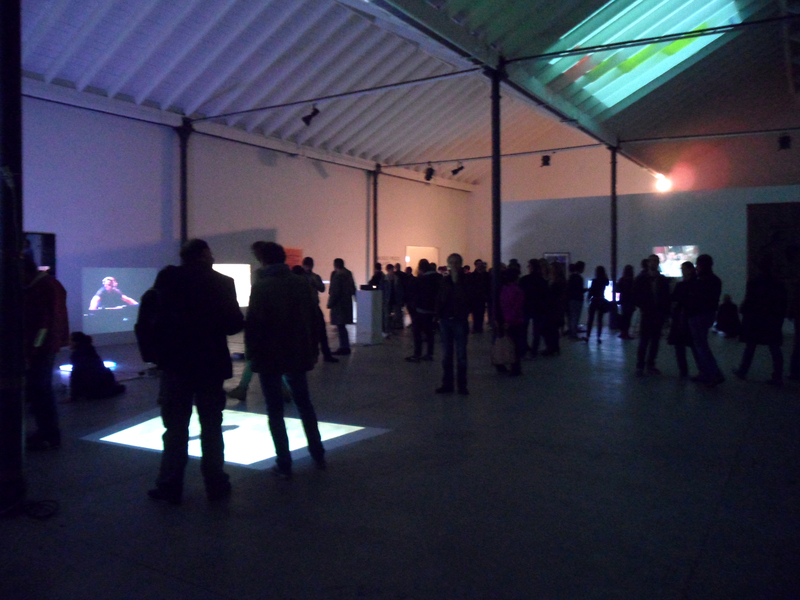 BYOB MILANO will take place in the exhibition space of Museo Pecci Milano, and will host in a flexible, always-changing setup the work of many artists, including: Alterazioni Video, Andreas Angelidakis, Ivano Atzori, Fabrizio Bellomo, Enrico Boccioletti, Paolo Branca (VjVISUALOOP), Martin Butler, Marco Cadioli, Diego Caglioni, Claudia Campus, Sarah Ciracì, Adam Cruces, Sabine Delafon, Carlo dell’Acqua, Matteo Erenbourg, Francesco Fonassi, Helga Franza, Silvia Hell, Iocose, KK,S, Luca Leggero, Les Liens Invisibles, Miltos Manetas, Kenji Matsushita, Marco Mendeni, Filippo Minelli, Molta Gente, Bruno Muzzolini, Otolab, Laurina Paperina, Angelo Plessas, Anja Puntari, Sara Rossi, Claudia Rossini, Rafaël Rozendaal, Santa Ragione, Lorenzo Sarti, Filippo Solibello, Priscilla Tea, Maurizio Temporin, Tonylight, Carloalberto Treccani, Carlo Zanni. 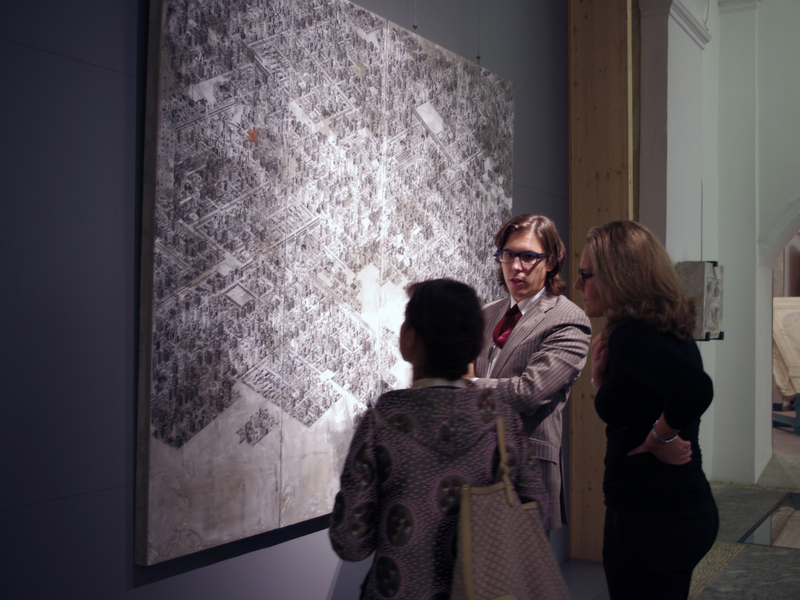 BYOB Milano is the first experiment of adaptation of this format to a museum space, and will profit from the dialogue with some of the works of the collection, presented in the exhibition Turbolenze (curated by Stefano Pezzato). contraltare alla mostra milanese dell’artista che sarà allestita durante la Fiera di Arte Accessibile 2013, presso la sede del Sole 24 Ore di Milano, nel mese di aprile. Theca Gallery ha voluto fortemente credere in questo artista, dando la possibilità ad appassionati e collezionisti di avere due mostre personali dell’artista, una a Lugano e l’altra a Milano, dove l’artista realizzerà anche un’installazione video site specific in cui il pubblico sarà attivamente coinvolto. "A CONTRIBUTION TO ANONYMOUS HISTORY"
- Evolution Life is a site-specific video installation that plays in the construction and deconstruction of hypothetical scenarios of video games. It is a new interpretation of universes now in disuse. 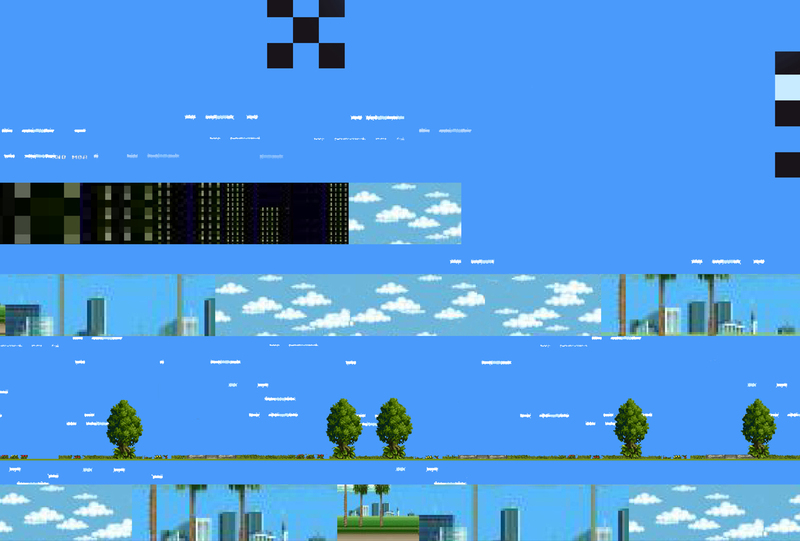 The videogame 80's are broken, reprogrammed and then deprived of their original function. A loop of electronic platforms that show us a world, now deserted, awaiting permanent. THE NEW SHOWCASE FOR INNOVATIVE ART AND TECHNOLOGY IN ATHENS GA, TAKES OVER DOWNTOWN ON MARCH 9th, 2013. — presso Athens, Georgia, U.S.A. 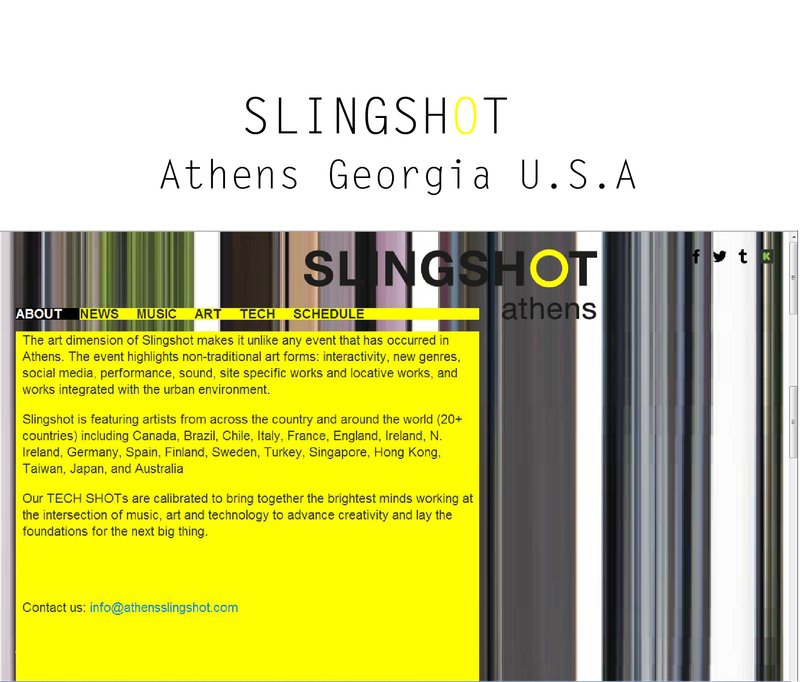 The art dimension of Slingshot makes it unlike any event that has occurred in Athens. 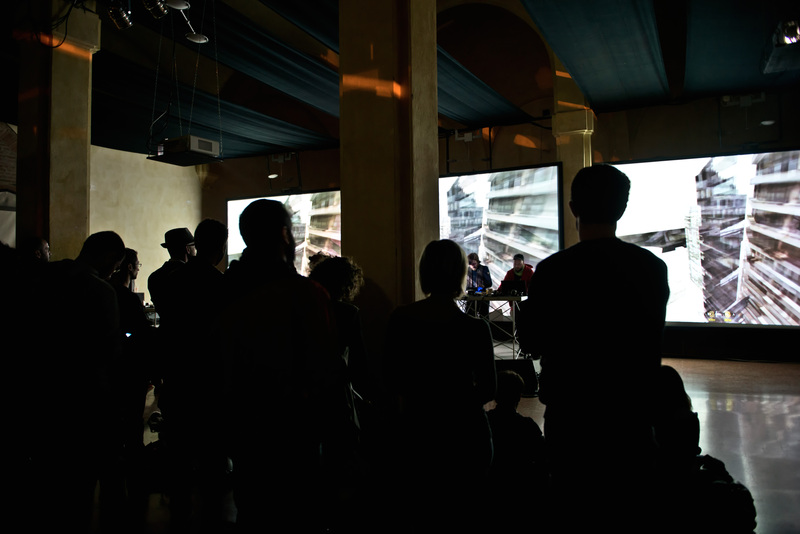 The event highlights non-traditional art forms: interactivity, new genres, social media, performance, sound, site specific works and locative works, and works integrated with the urban environment. Our TECH SHOTs are calibrated to bring together the brightest minds working at the intersection of music, art and technology to advance creativity and lay the foundations for the next big thing. Athens GA has been the birthplace of a variety of music and art movements over the past decades - come join us for the start of a new one! Game Art - Percorso espositivo articolato in una serie di opere consapevolmente contaminate da suggestioni videoludiche, nelle quali si riscontrano linguaggi e tematiche proprie dell'immaginario dei videogiochi. 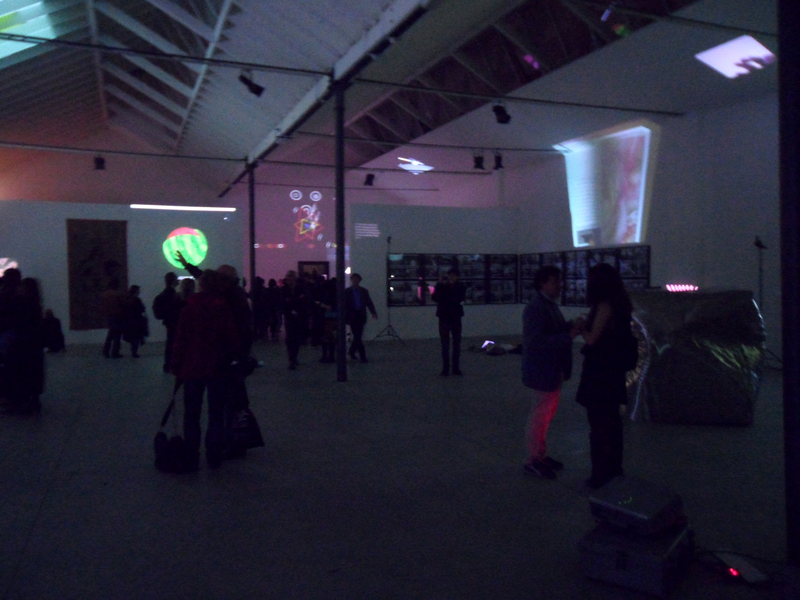 L'esposizione comprenderà opere di Matteo Bittanti, Emanuele Bresciani, Marco Mendeni, Shinji Murakami,Kenton Sheely, TonyLight e VjVISUALOOP. 9/ 11/ 2012-GAMES WEEK  Fiera Milano City curato da Game Art Gallery. > Take and assault one of the contemporary entertainment fetishes, the video game: "FOV01" by Marco Mendeni. 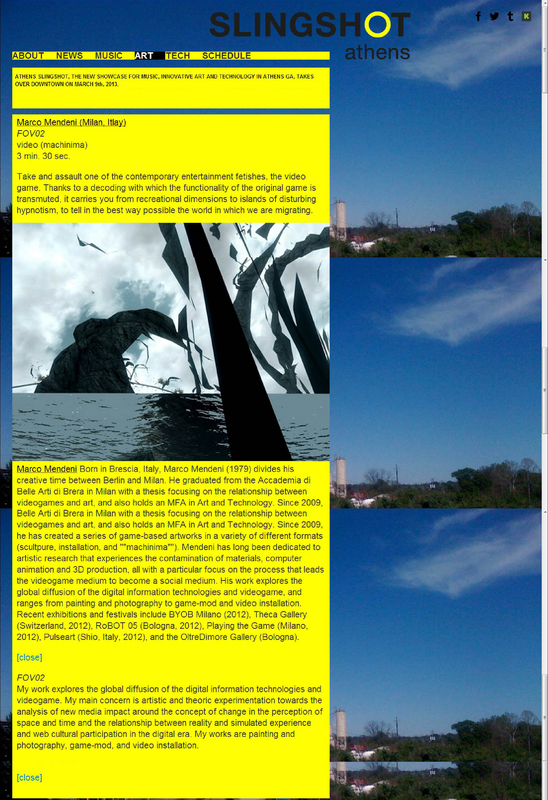 Thanks to a decoding with which the  functionality of the original game is transmuted, it carries you from recreational dimensions to islands of disturbing hypnotism, to tell in the best way possible the world in which we are migrating. MARCO MENDENI/Game Art visualsfor hacked videogame and real-time samplerI’m not playing is an audiovisual performance that talks about the relationship between the videogame medium and the culture of simulation in the digital era.